Well, it’s been a week since our cat Turbo passed away. A whole week. And I still miss that cat tremendously. You know, in retrospect, I wonder if Andrew knew Turbo was sick? Remember how I talked about Andrew suddenly hissing at Turbo whenever he came near? What if Andrew could smell the sickness? The other cats were behaving strangely as well. I remember the Wednesday before Turbo passed away, when we first saw pee outside the litter box but weren’t sure who culprit was, all the cats were acting weird. Not quite frantic, but they seemed on-edge and anxious, more high energy, like they were trying to tell me something. They were acting like they do when they want food, only they had plenty of food. Only at the time, I dismissed it as them all just being weird wanting me to think they were hungry. But …what if they just knew? Or maybe it’s nothing. Maybe in my grief, I am seeing signs that in reality, weren’t there. Or at least, maybe they weren’t as obvious as I think they were. Sometimes I wonder if I’m taking these subtle signs and turning them into huge cement blocks of guilt and hanging it around my neck. I can’t stop feeling guilty. I feel like I was a bad mom by not sensing just how sick he really was. Since his death, we haven’t had to fill the water bowl nearly as often. As in, instead of filling it at least once a day or sometimes twice, we’re now filling it every three days. He’s always been a thirsty cat, ever since I’ve known him anyway. Maybe that was another sign that he was ill.
Ah, who knows. It could have been anything. I know many people out there think I’m crazy for being this upset over the loss of a cat. But look. Turbo wasn’t just a cat. He was a member of our family. We fed him, took care of him, taught him to behave, and most of all, we loved him. And in return, he loved us unconditionally. He had a wonderfully quirky personality, even if he was a bit defensive at times. (Before Paul got him from the rescue center, Turbo had been severely abused by his previous owner.) Turbo was highly independent. A quiet sentinel who stood guard over Nathan. 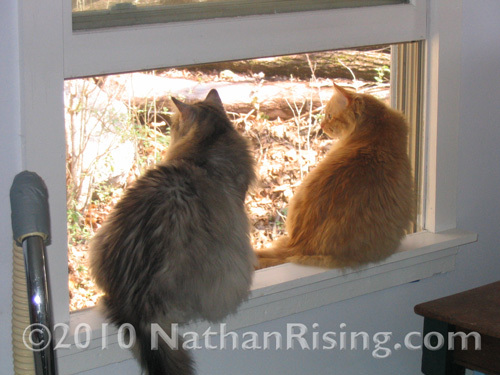 He was the only cat out of all ours that actively sought Nathan out. 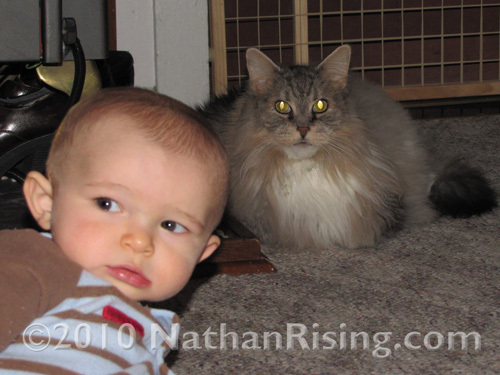 And whenever I had Nathan in his room with the baby-gate in the door (like when I needed to mop), you could count on Turbo sitting right there, watching Nathan play. Sometimes Nathan would toddle over to the gate and stick his fingers through the holes, and Turbo would saunter over and sniff them. I bet he wondered what that animal-cracker smell was…. Nathan’s hands always smell like either animal crackers or Cheerios. 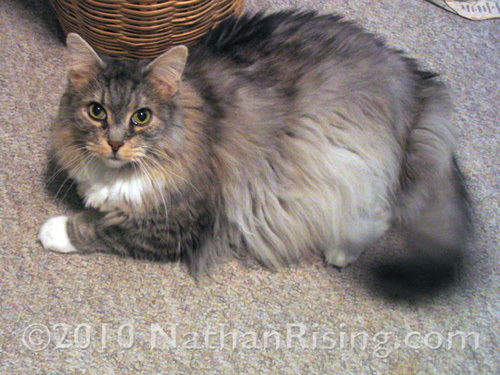 And when Nathan was not behind the baby gate, Turbo was exceedingly patient when Nathan would yank one of his legs, pull his tail, or yank out handfulls of fur. Nathan doesn’t grasp the concept of being gentle just yet! Turbo was very patient when we bathed him, as well. He obviosly didn’t like baths, but he let us bathe him anyway, and get this- he would even let Paul use the blow-dryer to dry his fur! 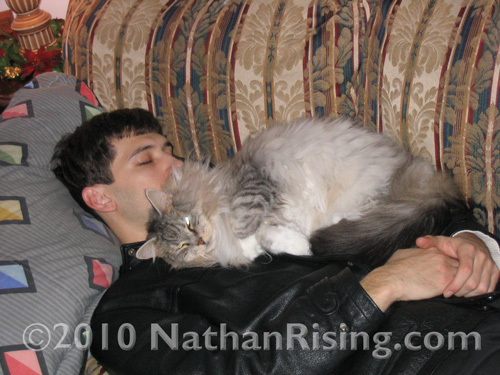 I remember before we banned the cats from our room and Nathan’s room (due to my allergies and too much cat fur getting everywhere), he would sleep on our legs. He was so heavy that once he laid on our legs, it was as if we were paralyzed and unable to move them. Turbo the Terrible was a solid 30 pounds of muscle (well, ok. He had some fat, too.) 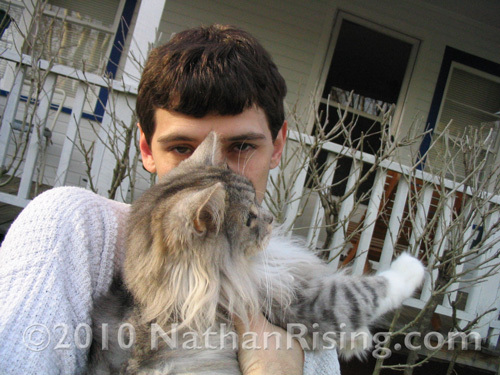 He used to curl up around my head and sleep on my hair. Our front porch has rails and a gate, and Turbo was the only cat we would ever let outside. He was really good about not trying to jump off. The other cats, however, would immediately start sniffing for a way to get down, which is why we didn’t let them outside (we live really close to a busy road) but Turbo just loved laying outside, swishing his tail contentedly, not worried in the least about trying to get down off the porch. Just happy to be outside. We shaved Turbo two weeks ago because his fur was crazy matted. Worse than it had ever been before- we don’t know how it got so bad unless it was because he recently started going under the couch. We have noticed that within the past couple of months, his coat has gotten duller, more coarse, and would knot up and mat more easily than ever before. After we shaved him, he seemed to be embarrassed and started hiding under the cat-tree in the back room of the house. He would still come out to eat, drink, socialize, and use the litter box though. He would even walk around the house or sit with us for a bit in the living room but always retreated back under the cat tree. So we thought he was just a little embarrassed and that he would get over it in a couple days. But then I think his embarrassment turned into depression because I noticed the litter boxes weren’t as dirty, so he must have started eating/drinking less. But he was still eating and drinking- I watched him do it. He would wait patiently at his food bowl, nosing his way past the other cats as usual. And then this past Wednesday, one of our cats started peeing on the floor (in the backroom on the tile, always near the litter boxes or water bowl). We knew it wasn’t a behavioral issue and that it was medical because the pee was kind of thick and a dark yellowish/orange color. We cleaned the water bowl (one of those fountain ones with a filter) but we didn’t know who was peeing outside the litter box because we didn’t catch any of them in the act until Friday afternoon, when we saw it was Turbo. Then, after the first time we caught him, he peed out this weird puss or something, so we thought he was ill because he had a urinary tract blockage and that the puss and gross matter we saw was him passing it. So we thought he would be ok because the next time he peed, his pee was paler yellow and more normal looking. So we just thought that the blockage was making him sick and now that he had passed it, he would recover nicely. We thought we would try to get him through the weekend and if he still wasn’t better by Monday, we would take him to the vet. But we shouldn’t have waited. Had we only known how sick he really was. I wish we had known. On Saturday, we initially thought he was doing better because his pee started looking even more normal yellow. But then around 6pm, we brought him out from his hiding spot and tried to get him to eat, but he wouldn’t. We noticed he had suddenly lost weight and you could see and feel his spine and shoulder blades, and his abdomen was bloated. Turbo was so weak he couldn’t hold himself up. He was lethargic and just laid there on his belly with his poor little legs splayed out. He would try to stand up but he just couldn’t. Paul tried to hand feed Turbo some wet food and was able to get a couple tablespoons into him. It seemed to help Turbo. After he ate, he gagged and heaved a little, but he seemed to get a bit of energy and looked alert. Then he managed to walk/slink/shuffle his way back to his hiding spot under the cat tree. But he was looking better. He was holding his head up and looking around the room. Again, we thought he would be ok, that we just needed to get some food into him. I texted my mom, my brother, and one of my dearest friends to pray for Turbo, and right as I pressed send, Paul said “Jen, get back here. He’s not going to make it.” His voice was strained and filled with tension, so I ran back there as fast as I could. He was stroking Turbo’s head and back. I put my hand on Turbo’s head and rubbed his ears. “Big guy, you’re gonna be ok, right?” I said. I put my hand under his chin and lifted his head up but he was limp. I looked at Turbo’s beautiful face, and to my horror, I literally watched the last bit of light fade out of his eyes. I looked at Paul’s hand lying on Turbo’s back. “Paul he’s not breathing!” I exclaimed. 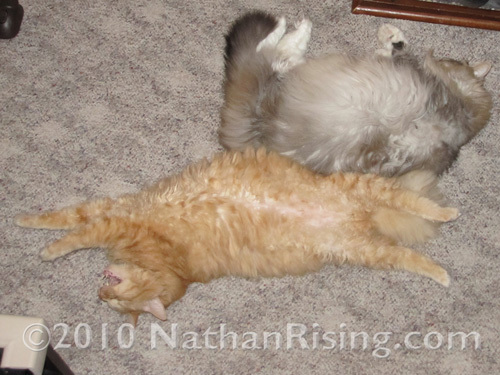 Paul looked down, his eyes widened, and then he put Turbo on the floor and tried in vain to resuscitate him. He shook him saying “Please don’t go. Wake up, big guy! Come on, Turbo, wake up!” He even stuck his finger down Turbo’s throat just in case Turbo had choked on the food Paul gave him, but there was nothing in his throat. He was gone. My heart hurts so bad. I feel like I should have known he was sick. I feel like I should have seen the signs. But I thought (and hoped) Turb would get better. Deep down, I knew it was serious but Paul and I must have been in denial because it just didn’t seem like it was possible that Big Turb could be that sick. He was such a big, strong cat. It just happened so fast. In a matter of days, our perfectly healthy gentle giant completely spiraled downhill and then died right in front of our eyes. He never cried out in pain, never told us he needed help. Instead, he hid. He even purred and seemed to enjoy us loving on him right up until the moment he passed. Turbo was Paul’s baby. He loved that cat, raised it since it was about one or two years old. He’s devastated. We’re both physically ill over this. We can’t sleep, can’t eat. Can’t stop thinking about it all. The “what if’s” are plaguing us. What if we had taken him to the vet as soon as we saw he was the one peeing on the floor on Friday? What if we hadn’t fed him that extra food at 9:00? Because it was right after that that he passed away. What if we had never shaved him? Because what if his depression lowered his immune system and enabled him to get sick? What if the blockage of stuff we saw in his pee had caused him to have kidney failure? If we had gotten him to the vet, would they have saved him? Was his dull coat a sign that he was already having problems? 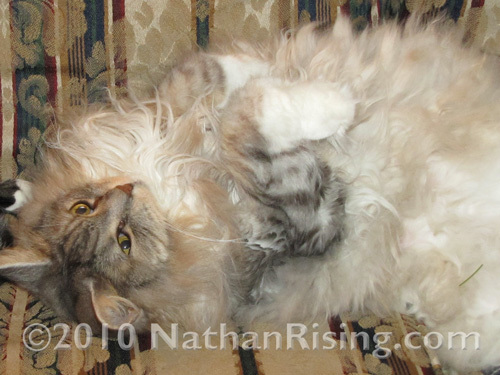 What if we had taken him to the vet when his fur started matting up more than usual? What if… what if.. what if? I saw him die right in front of me, with my hand on his head, I saw the light fade out of his eyes. I keep thinking about those last moments… how he was in pain. Was it even worth him being held? Did it comfort him as the light faded from his vision? Was he disappointed we didn’t save him? Did he know how much we loved him, how much we didn’t want him to go? He was such a big, strong cat. I can’t believe he’s gone. I just don’t know. This is just so hard. If you have a pet, and you think he/she might be sick, please do not hesitate to get them to the vet immediately. DO NOT WAIT IN HOPES THAT THEY WILL GET BETTER, because they could get worse in a matter of minutes, right in front of you, no matter what you do. If money is a factor, remember that money is replaceable but you will never, ever be able to replace your pet. Be diligent in watching their health and TRUST YOUR INSTINCTS. If your instincts say your pet is sick, no matter how healthy you otherwise think they are, please get them to the vet. It could save your pet’s life.